...hence the birth of the British Thermal Unit! “A cubic foot of water” later became one pound of water and the modern definition of one BTU became “the amount of energy needed to change the temperature of one pound of water one degree Fahrenheit”. Sensible heat is simply heat that can be measured with the use of a thermometer. A thermometer reacts to the intensity of BTUs. It can also be described as a change in the temperature of a substance with no change in its state. For example, let’s say you’ve brought home your favorite carbonated adult beverage. It’s at room temperature ( 70º F) and you like it frosty, so you put it your fridge which is much cooler then the room ( 35º F ). Your beverage gives up its heat to the air inside the fridge and therefore drops in temperature. According to Newtonian physics, high energy will tend to move towards low energy. Basically, heat moves from high heat to low heat. In air conditioning, the temperature difference across the evaporator is also a sensible heat change. The word “latent” is Latin for “hidden”. Latent heat is hidden heat and therefore cannot be measured with a thermometer, but make no mistake, it still exists. The best example of latent heat is boiling water. As water is heated to 212º F, the temperature remains constant but the state of the water (solid/liquid/vapor) changes. Try this experiment: Fill a pot with distilled water and bring it to a boil. The temperature will remain at 212º F (at sea level) until all of the water has vaporized. You can do the same experiment with crushed ice and distilled water. The temperature will remain at 32º F until all of the ice has melted and only liquid water remains. The temperature of the liquid will then begin to rise until it is equal to the temperature of the room. This is a great way to test your digital thermometer for calibration and make the appropriate adjustments. In the process of conditioning air, we are controlling four things: temperature, humidity, indoor air quality and circulation. The temperature change is the removal of sensible heat, while the humidity change is the removal of latent heat. The size of an air conditioner is dependent upon the amount of sensible and latent heat gained inside a conditioned space. We’ll have a more detailed discussion about how humidity comes into play in a future post. Within the refrigeration cycle, there are both sensible and latent heat changes. For example, the refrigerant enters the evaporator as low temperature, low pressure boiling liquid. As the liquid travels through the evaporator, it absorbs heat from the air around it causing the boiling liquid to vaporize. The temperature of the liquid will remain the same until ALL of the liquid has vaporized. That is latent heat exchange. After all the liquid has boiled off and only vapor remains, the temperature will begin to rise. The state of the vapor won’t change but the temperature will. That is sensible heat exchange. Both are examples of BTUs being added to the refrigerant. 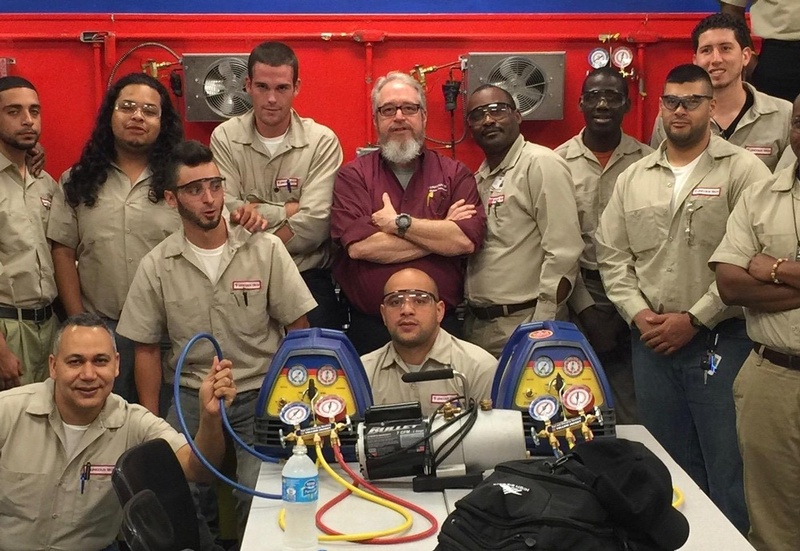 It is essential, as HVACR technicians, that we have a complete understanding of heat. Managing comfort is all about managing heat!